George Graham Reviews The Elovaters "The Cornerstone"
In the forty years since reggae began attracting audiences in the US, the style has gone in a few different directions. There are the traditionalists, there are those to take up the more sonically manipulated “dance-hall” style and those who bring in all the trappings of commercial pop. Reggae has likewise spread from Jamaica world-wide with bands from all over, including Africa, the Middle East including Israel, and of course, the US. There are also the bands who are heavy on the message or with the lyrics showing devotion to Rastafarianism. This week, we have the new release by a band that is on the lighter side of things, with easy-going, but very attractive music that largely eschews the electronics of the dance-hall or EDM (electronic dance music) scenes, instead, using frequent acoustic guitars, and the kind of appealing vocals that conjure Bob Marley. 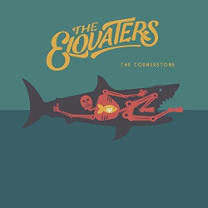 The group is called the Elovaters, and their new release is called The Cornerstone. The Elovators are from Boston, and are fronted by lead vocalist and rhythm guitarist Jason Wetherbee. The title of their album comes from the former name of the band The Cornerstone. They have done a fair amount of touring, opening for acts like Ziggy Marley, The Movement, and John Brown’s Body. Their sound is clean and easy-going, but with a fair amount of musical sophistication in their arrangements and the compositions, which are more likely to have different sections and musical transitions than is usually heard in reggae. The acoustic guitar can impart a hint of a folky sound – though some may recall Bob Marley himself did a number of acoustic recordings. The Elovators also have a horn player, Nick Frenay, who plays both trumpet and sax, and through overdubbing is heard as a little horn section. Otherwise, the musicianship is first-rate and the songs are largely outstanding, though there is nothing very deep there, some party songs, love songs, and one that is almost a kind of political protest, but the music is mostly designed to be danceable. Jason Wetherbee can at times resemble the vocal sound of Jack Johnson and his airy tropical approach, while at others he can get into hip-hop style phrasing though still singing rather than rapping. The Cornerstone the new release by the Boston band The Elovaters, formerly known as The Cornerstone, represent the light, appealing side of reggae. The songs are generally positive lyrically and tunefully melodic. This band of New Englanders do not go for Rastafarian-influenced lyrics and lead vocalist Jackson Wetherbee has a kind of charismatic quality that is a cross between Bob Marley and Jack Johnson. The musicianship in the band outstanding, with more variety of instrumental textures than is typical for reggae, including the horns of Nick Frenay, and some wider-ranging keyboard sounds from Myles Sweeney. Drummer Nick Asta is particularly solid. The band’s arrangements and the compositions themselves are more eclectic than usual for this kind of music, but for the most part maintain the solid reggae beat. We’ll give the album a grade “A” for sound quality. The audio is impressively clean and Wetherbee’s vocals have a pleasing, warm sound. There are some reggae-dub style echo effects here and there, but it’s nicely done adding textures without distracting from the music or the sound quality. Dynamic range is somewhat better than the current average among pop albums. The Elovators have created a very enjoyable, danceable reggae record that nevertheless shows a fair amount of musical class and savvy. It’s a great combination.